To show that the area of a trapezium is equal to half the product of its altitude and sum of its parallel sides. Trapezium is a quadrilateral with one pair of opposite sides parallel. A quadrilateral is a parallelogram if a pair of its opposite sides are parallel and equal to each other. The parallel sides are called "bases" of the trapezium and the other two sides are called the "legs" of trapezium. Consider trapezium ABCD. 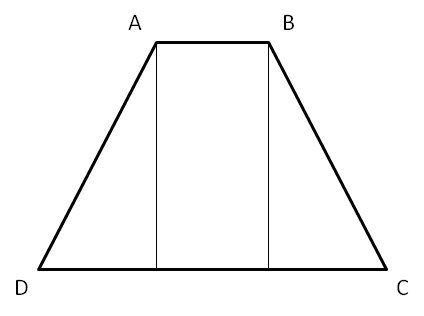 AB and DC are the bases (parallel sides) and h is the height of trapezium ABCD. We observe that parallelogram ASPD is formed by combining two trapeziums ABCD and BSPC. Thus, area of a trapezium is equal to half the product of its altitude and sum of its parallel sides. Find the area of the following trapezium.